When Cure & Penetrating Sealer (CPS) is applied to concrete, it will penetrate deeply through the porosity and capillary system which formed as the water left at placement, Cure & Penetrating Sealer (CPS) reacts with the concrete’s unbound free constituents, such as unused calcium hydroxide residue and / or alkali. This reaction converts Cure & Penetrating Sealer (CPS)), which is virtually zero in solids, to a 100% solids colloidal silicate precipitate (gel) that is internally generated and insoluble. 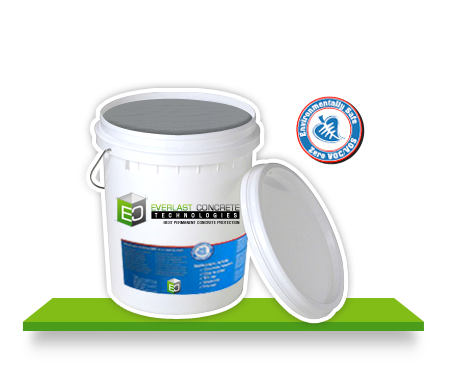 This Cure & Penetrating Sealer (CPS) gel forms and occupies the concrete’s matrix porosity and capillary system which adds density, seals and strengthens the concrete. Cure & Penetrating Sealer (CPS) as a curing method. Better than water pond curing. When Cure & Penetrating Sealer (CPS) is applied as a curing agent, ingredients are added to the existing capillary mix water allowing for a more completed and higher quality hydration reaction process. This will result in additional hydrate product to fill the voids typically left behind as the water leaves the concrete. The result is better curing, hydration and internal sealing of the concrete. The application of Cure & Penetrating Sealer (CPS) will enhance any Portland cement concrete’s over all integrity as it supplements, densities, waterproofs and internally detoxifies without effecting the concrete’s surface traction or bond ability of other surface applications.